Bet on this weekend’s match between Man City and Arsenal with Premier League Free Bet offer! Make a wager on the Manchester City vs Arsenal, and if Sky Blues striker Kelechi Iheanacho strikes the first goal of the game, you’ll receive $100 with the Premier League Free Bet deal! Use the following Bonus Code to claim the Premier League Free Bet offer: WEEKLYSB. Although Leicester City have won the title (read more on this), the Premier League is still two games from being officially over, and some clubs are still fighting for their position on the table. Manchester City are 4th on the table with 64 points, while at the moment Arsenal are clinging on to 3rd spot with 3 points more. It’s fair to say that this upcoming game is crucial for both sides, as they aim to create some breathing space between for the Champions League spots. If Arsenal lose, they’ll find themselves in their familiar surroundings that they’ve occupied for the most part of the last decade – the fourth position. So, they’ll be aiming to win this one, although their record away from home (W 8, D 6, L 4) indicates they’re equally prone to draws as they are to wins. If the Sky Blues lose this match, they risk inspiring their cross-town rivals Man United to battle fiercely for the 4th spot in the Premier League, as they’re currently in 5th with 4 points less than Man City. Manuel Pellegrini is in charge of the club for two more games, so he’ll want to secure a Champions League qualification spot for the incoming manager Pep Guardiola. Winning one of the last two games will see to it that Man United miss out on Europe’s elite competition once again, which will at least give Man City bragging rights over their fierce rivals. The Sky Blues are favorites to win in front of their home fans 2.35 (27/20), although the Gunners are not far behind with their chances 2.75 (7/4), per online sportsbook Intertops. With the way both teams have played in recent games, a draw may be on the cards for this one 3.40 (12/5). 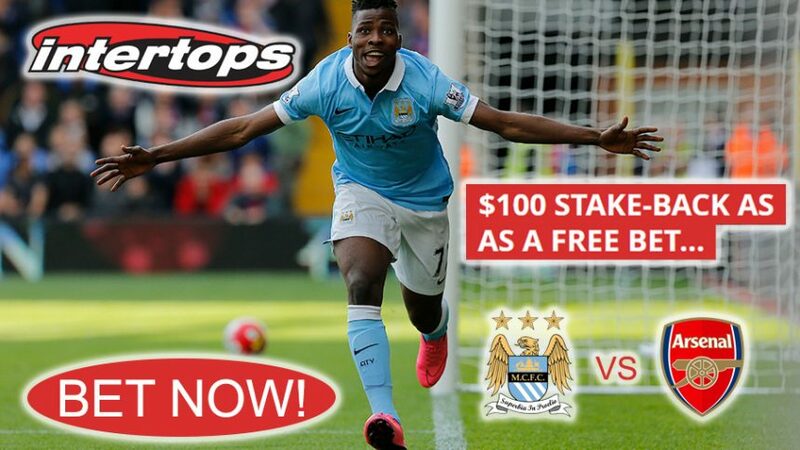 Join online sportsbook Intertops and claim $100 with the Premier League Free Bet offer! Get your Premier League Free Bet now! Collect €10 with Betsson’s Euro 2016 Free Bet!